Professor Douglas Lind joined the faculty in 2007. He received a B.A. degree in political science from Purdue University, a J.D. degree from Valparaiso University, and an M.I.L.S. from The University of Michigan. 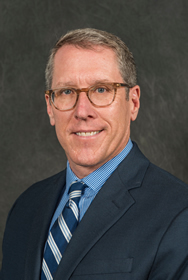 Prior to coming to SIU, Professor Lind was the Head of Collection Development at Georgetown University School of Law Library where he also taught Advanced Legal Research and Seminar Research Methods. His writing and research interests focus on the production and marketing of American printed materials in the mid-19th and early 20th centuries. He is the recipient of the Joseph L. Andrews Bibliographic Award, a national award which recognizes a significant contribution to legal biographical literature, for his two-volume reference work, Lincoln’s Suspension of Habeas Corpus.